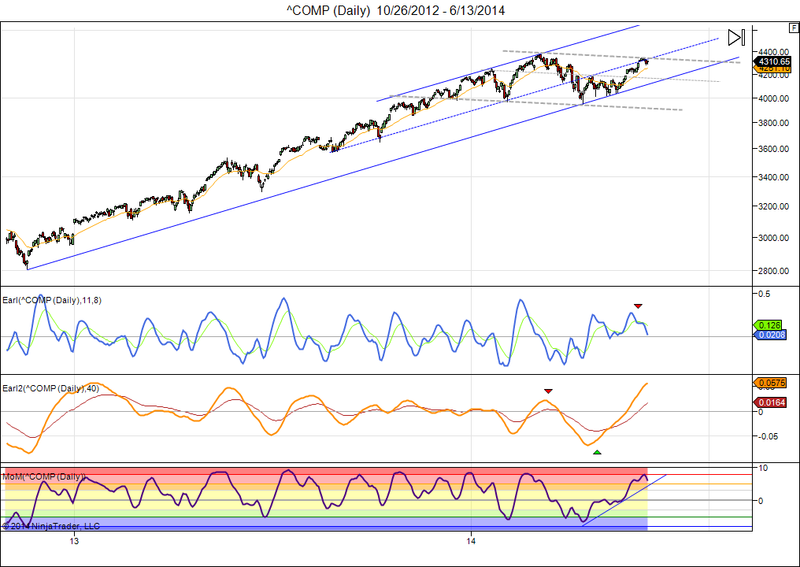 A sideways channel may be forming (grey dashed lines), with the Nasdaq hitting overhead resistance around 4350. Several other markets have reached major Top targets in our weekly key reversal levels, with daily momentum (MoM) now going down. This could keep us in a sideways to down pattern for several more months. 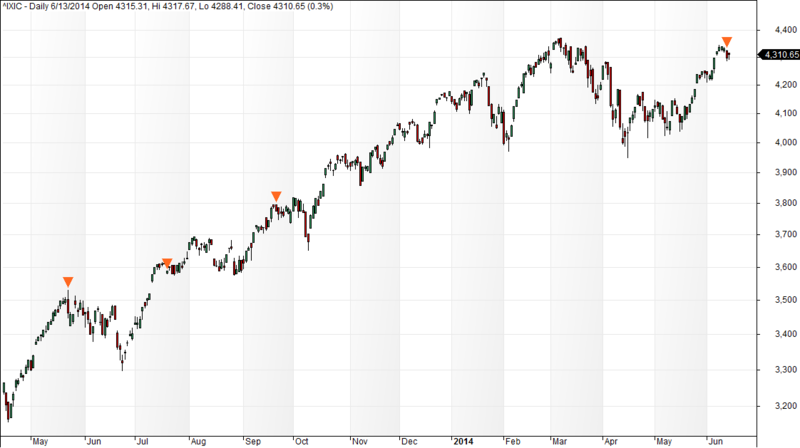 In this Nasdaq chart we see that technically my Earl indicator has topped out already, with the longer term Earl2 also slowing down at a high level. This is not the kind of setup we typically see at major buying opportunities. A drop back towards 4200 is easily possible in the coming weeks, with 3850 the first target if we get a more prolonged correction. This week I also want to share an interesting concept that caught my attention thanks to Kora Reddy of Paststat.com, who posted the idea on Scutify. In a nutshell, we watch out for long sequences of days where a given market fails to close below the previous day’s low. If this happens for weeks on end it means the bears are too weak to push the market lower and also close it lower. Every dip is being bought and the market just continues up and up. Eventually this comes to end when the market does produce a close that is below the previous day’s low and that’s when we get an interesting signal. Last Wednesday this happened for the S&P 500, when a series of 17 days without a “close < previous day’s low” came to an end. 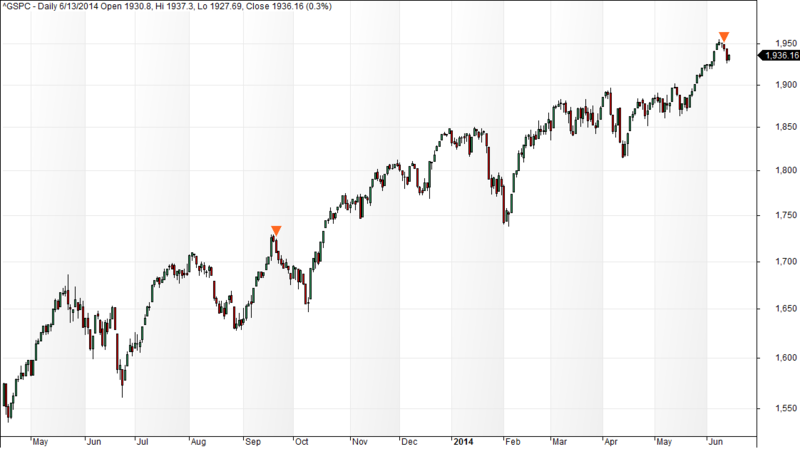 The same happened for the Nasdaq on Thursday (after 18 days). What is so interesting about it? Well, when this happens we either have a strong ongoing bull market that soon resumes with higher highs, … or a significant correction is seen in the ensuing weeks. The reverse also works: when we have a long series of days without a close above the previous day’s high it shows a possible exhaustion of the bear market. With some backtesting I determined that the optimal threshold is 15 days or more. This type of signal is rather rare, but when it happens we better pay attention. 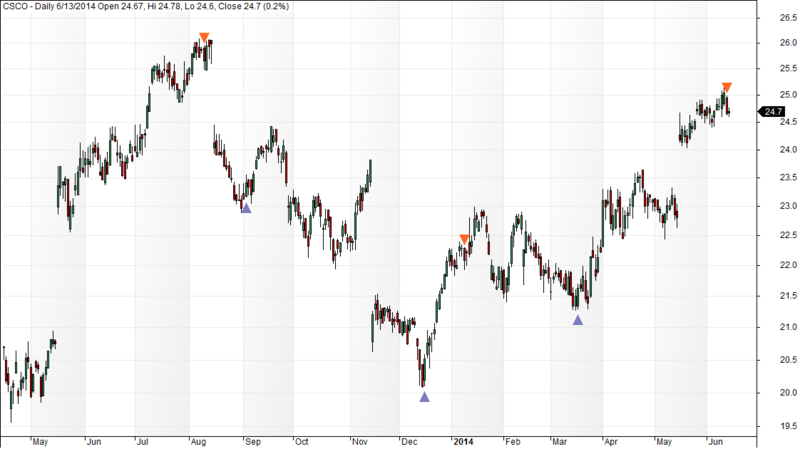 As we can see, not all these exhaustion signals led to a move in the opposite direction, but a good deal of them did. 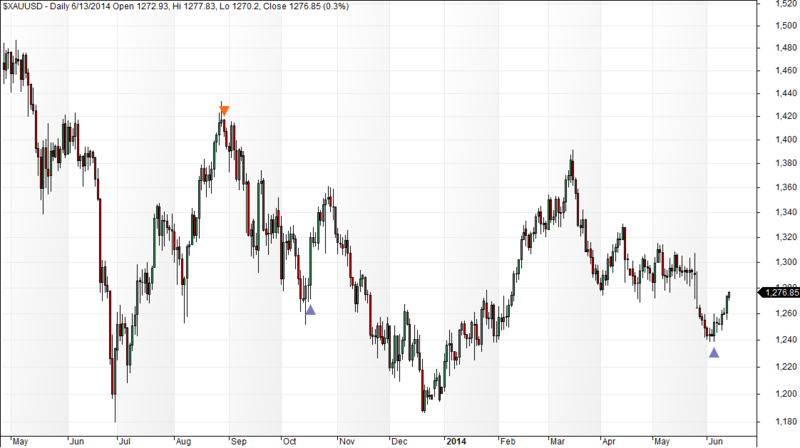 Would you rather be long or short after seeing an orange triangle in a chart? 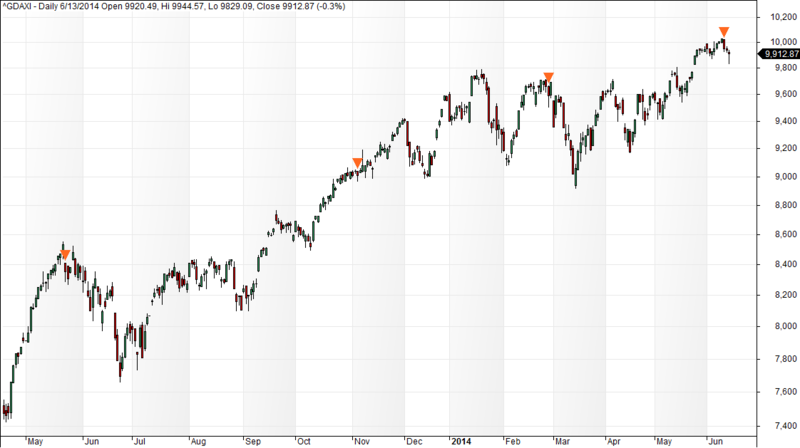 Most major indexes and a lot of individual stocks had a bull exhaustion signal last week, with the FTSE 100 getting one in May and failing to make new highs ever since. 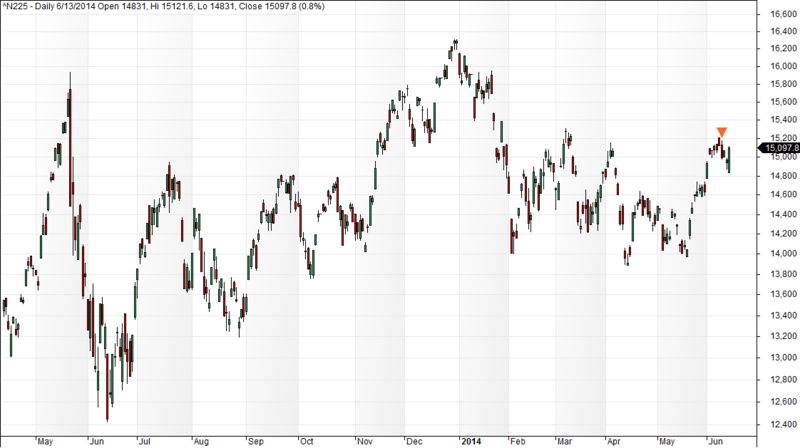 This is not a reason for panic, but definitely a reason for caution in the stock markets in the coming weeks. For gold we had a bear exhaustion signal in early June, and since then the yellow metal has been climbing nicely. So, these exhaustion signals are worth watching, something that many traders are probably quietly doing already. 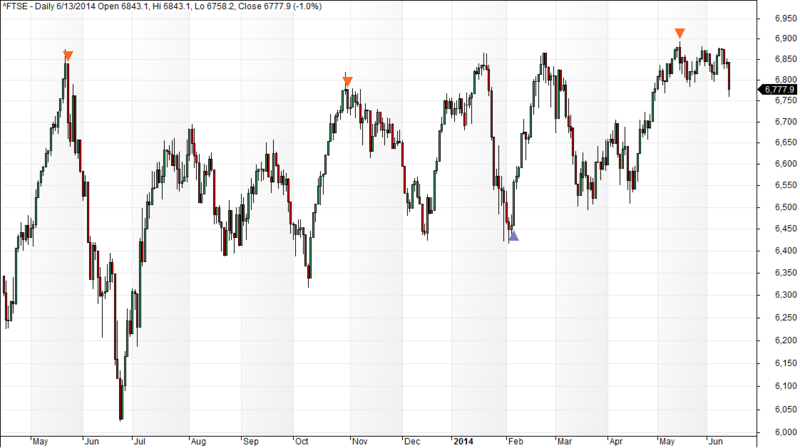 This entry was posted on June 16, 2014 at 11:45 am	and is filed under Financial Astrology, Market Commentary. Tagged: exhaustion, lunar cycles, Nasdaq, S&P 500. You can follow any responses to this entry through the RSS 2.0 feed. You can leave a response, or trackback from your own site.